Mark and I met with Brendan at South Wales Caving Club on Friday morning, and after some deliberation around the teapot decided to go and explore Pendulum Passage in OFD II. Brendan decided on a short cut via Chasm passage. Rigging a handline, Mark free climbed. Having a little more sense and as we were carrying SRT kits anyway, Brendan and I abseiled down after him. Half way along The Chasm Brendan started chuckling as he realised we were approaching a particular climb up, which I had dubbed the “stupid f***ing ladder climb” during a previous trip where I had numerous attempts at climbing it, only to Tarzan-swing back down the hand line - finally demanding a ladder! I eventually got up with help from Mark and Brendan and my jammers, but still not happy with the climb! Arriving at Pendulum passage I was the only one already wearing SRT kit so went ahead and rigged the first pitch. The bits of tat provided for deviations bore no relation to the rigging guide we had but I continued anyway, finding that the rope length suggested was only just enough to reach the bottom. Unfortunately I rigged one of the deviations far too short, which tested Mark and completely confused Brendan! Continuing along past many awkward climbs and 2 more short pitches we reached an exposed climb down to the stream way which had been our objective of the trip in preparation of a possible exchange with the Nave in the future. Going back up, prussiking past my short deviation again proved quite a challenge! Once out of the Crevasse we went to explore nearby passages of the Nynth Bran area. One section opened out on an exposed ledge way up in the roof of Chasm passage. Mark, of course, had to go off squirreling “I’ll just see if this is climbable…” and found it far more difficult to get back! 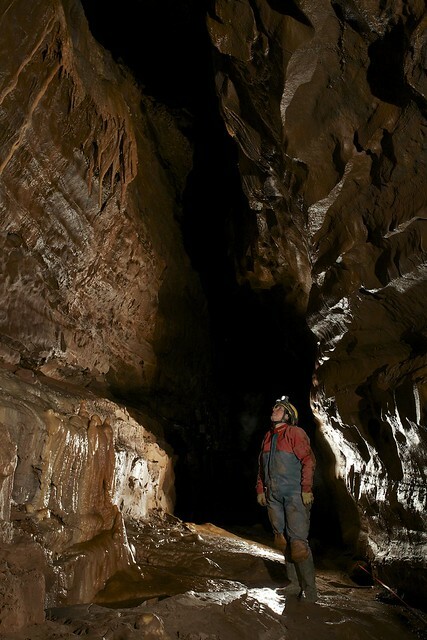 A thoroughly enjoyable trip and a good start to our Easter Long Weekend of Caving!